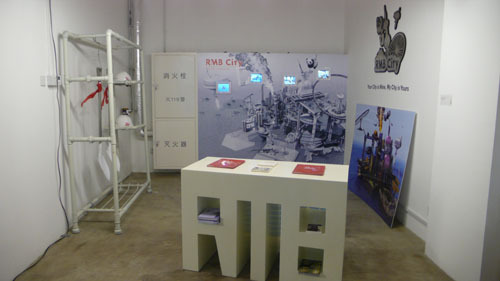 The RMB City team is excited to see the RMB City corner at the Shop – a new space run by Vitamin Creative Space founded by Hu Fang and Zhang Wei. At the Shop’s opening (Nov 8th, 2008), among different works by artists including Huang He, Chu Yun and Duan Jianyu (and of course Yan Jun’s mantra-humming-esque work), one piece that drew people’s attention was the four videos of RMB City by Cao Fei (aka China Tracy), juxtaposed with spades and safety helmets with RMB City logos. The physical form of these construction tools , materialized the intrusion by the imagination of Cao Fei into the reality and also the minds of the viewers. The overlapping of reality and cyberspace in the RMB City corner demonstrates an interesting process of symbolic exchanges between the reality and virtual space. The set of symbols that is external to the virtual world is a Big Other which allows and also restrict the viewers of the RMB City, wherein they can immerse in its virtuality with a “distance (that) is rather a positive condition of immersion” (“The Cyber Space Real”, Slavoj Zizek). With expected updates, this RMB City corner will become an information center for people who are interested in RMB City/ Second Life. Not only does the corner offer a ride to the virtual experience to these people, but also act as a crack which allows the virtual realm filled with Chinese icons.